Photo: PATH/Kelly Fallt. Global Digital Health Forum opening session. The field of digital health development is diverse and growing! Countries remain at the center of the digital health landscape, and the scope of support from donor, implementing, and private-sector partners is vastly expanding. 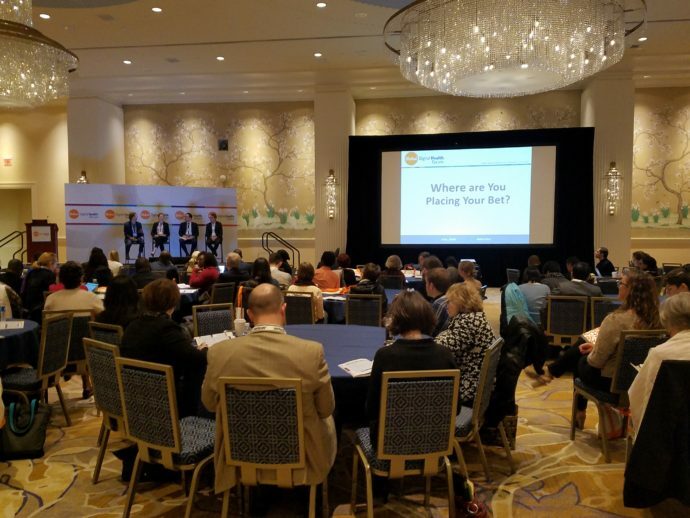 The private sector made a strong showing at the GDHF, with colleagues from Merck, Johnson & Johnson, the Novartis Foundation, and Nokia speaking during panels and in side sessions. Digital health is not just mobile apps. Mobile phones are an important – but not singular – part of digital health. Digital health includes the use of any electronic or mobile technologies that support better collection and use of data, improved quality and reach of health service delivery, and better decision-making by health service providers, workers, and patients themselves. Ultimately an enabler, digital health helps governments and other providers offer accessible, affordable health services to their populations, empowering individuals and their families to make better choices to improve their quality of life. 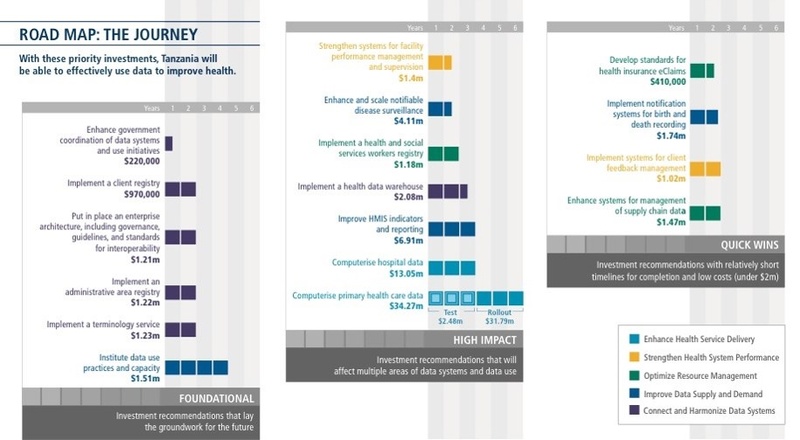 Digital health includes open source technologies (like DHIS2 and LMIS) and health information systems infrastructure that allows data to be shared across provinces, regions, and countries. Countries are taking the lead. Country delegations at the GDHF demonstrated the importance of empowering country leaders to drive the development of digital health agendas. For instance, the government of Tanzania is making impressive progress in developing a strong digital health system. Under the Data Use Partnership and with support from PATH staff, Tanzania recently completed a comprehensive investment roadmap; it includes 17 costed interventions needed to effectively use data to improve health across the country. To make this plan a reality, the government of Tanzania called on donors to make coordinated investments in health data. The Principles for Digital Development are at the heart of our work. Distilled from a consultative effort of more than 500 individuals representing 100+ development organizations, the Principles enshrine a set of nine, high-level concepts that should be considered before funding, designing, or implementing any technology supported development work. They emphasize key behaviors like design with the user, reuse and improve, collaborate, use open source and design for scale. Better health depends on better data. Digital health is playing a significant role in increasing the quality, availability, and use of data for decision making. This is apparent in the emergence of new partnerships like the Health Data Collaborative and in projects like the BID Initiative. The time for improved digital health connectivity and interoperability is now. Epidemics such as Ebola and Zika demonstrate the urgent need for a stronger regional digital health infrastructure. In health crises, the absence of this infrastructure means that the right information is not available for the right people at the right time. moving the focus of digital health activity to countries. PATH-led initiatives including the Data Use Partnership, BID Initiative, and the newly-announced Digital Health Initiative are on the forefront of this vision.